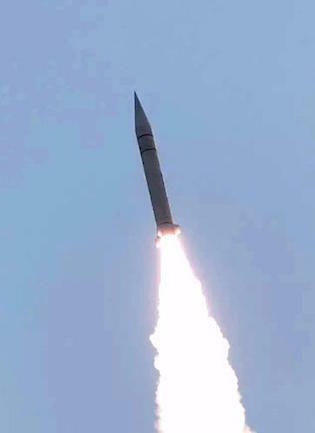 The flight test of the Xingkong-2 or Starry Sky-2 missile was disclosed by Chinese state media and touted as an ultra high-speed missile capable of thwarting missile defense systems. The officials confirmed the test was carried out over northeast China and reported in U.S. intelligence channels earlier this week. Such tests are closely monitored as part of the renewed focus by the Pentagon and U.S. intelligence agencies on China’s growing military power. Video released by Chinese state television showed the new weapon being launched atop of a ballistic missile. It was the first time the Chinese government commented publicly on its development of hypersonic missiles that are capable of delivering both nuclear weapons and conventional arms. In the past, tests of a Chinese hypersonic glider—an unpowered maneuvering high speed missile—were kept secret but frequently disclosed by U.S. officials. Unlike another Chinese hypersonic missile known as the DF-ZF, the Starry Sky-2 reportedly uses powered flight. The test was announced by China Academy of Aerospace Aerodynamics, the Chinese government agency in charge of development. The academy said in a statement the missile was launched Aug. 3 on a multi-stage rocked and during flight carried out extreme maneuvers at speeds of Mach 5.5 for more than 400 seconds. Hypersonic speed is considered faster than Mach 5, or five times the speed of sound. The top speed of the missile was Mach 6, or 4,603 miles per hour. According to Chinese reports, the experimental missile employs a wedge-shaped fuselage that is boosted to hypersonic speeds by riding the shock waves generated by its own flight to enhance lift. The new missile is part of a hypersonic arms race that has been underway for the past several years involving efforts by the United States, China, and Russia to build ultra-high speed weapons in response to increasingly capable missile defenses. Russian President Vladimir Putin touted Moscow’s advanced missile systems in development during a speech in March. Russia is building a long-range, guided-flight hypersonic missile called Avanguard. The current defense authorization act for fiscal 2019, to be signed by President Trump next week, calls for the Pentagon’s Missile Defense Agency to accelerate missile defense programs designed to counter hypersonic weapons. The legislation also requires Secretary of Defense Jim Mattis to submit to Congress a “validated requirement” for ground-, sea- and air-launched conventional prompt global strike hypersonic weapons in three months. Asked about recent Chinese hypersonic missile tests and whether China has mastered the technology, Strategic Command commander Gen. John Hyten said he is unable to confirm the status of the Chinese program. “The only way I could confirm it would be to reveal intelligence information, and I can’t do that,” Hyten told reporters in Omaha Aug. 1. “But I can tell you that from open source information, the Chinese government and the Chinese military are conducting very aggressive testing of hypersonic glide capabilities,” Hyten said. The U.S. military is “being aggressive as well,” he added. Because both China and Russia are strategic rivals “that means we have to be able to go faster than our adversaries,” Hyten said. Michael Griffin, undersecretary of defense for research and engineering, recently told reporters that developing hypersonics is a high priority for the Pentagon. Griffin described the threat from hypersonic missiles as not only nuclear delivery systems but for tactical strike weapons as well. “Very quick response, high speed, highly maneuverable, difficult to find and track and kill,” he said, Defense News reported. Space-based defenses could be used to counter the high-speed missiles. “The utility of space for hypersonic defense is in the indications of warning, the launch detection, the surveillance, acquisition, tracking—the whole arena of persistent global timely awareness,” Griffin said. Griffin said despite tests by China and Russia the United States remains a leader in hypersonic arms technology. Griffin said he is worried about the pace of U.S. hypersonic development and as a result will be speeding up programs. “You’re going to see our testing pace stepping up, and you’re going to see capability delivery from the early ’20s right through the decade,” he said. The post China Reveals Test of New Hypersonic Missile appeared first on Washington Free Beacon.